Thanks! Helpful to know Hutchy. Maybe some year a LT utility sled is in my future. Til then I'm left with 90s era polaris. You now have me thinking of fabbing up a rack or solo seat + rack for it. 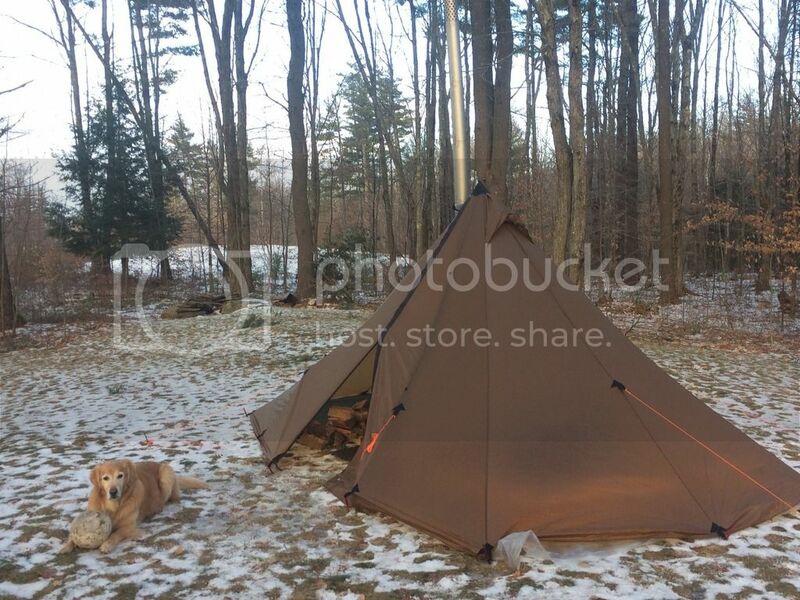 My hot tent is a a cousin to the Cimmaron--the Seek Outside Redcliff. I love it. New England's climate can be pretty unpredictable, with rain and sleet throughout the winter, so I opted for silnylon vs canvas. (Jealous of all you with more stable winters!) Since it's not conical, setup is really easy. I take along a handful of galvanized spikes because our snowpack is generally light enough that you can anchor in frozen ground. Stonehouse, As with most things, I would love to decrease some weight and bulk. The snowmobile was a polaris voyageur 155 with the extreme rack and custom dry bag, so space wasnt a huge issue. I would consider going to a synthetic shelter such as a kifaru sawtooth to save some weight and bulk, namely in the pole system for my 8x10 snowtrekker. However, I might miss the bombproof reliability of the snowtrekker and the ease of setup. As to the trailer, nope. No way for how I ride would I want to be towing. I for this trip I didnt even use my spare 2.5 gallons of gas. One change I might make woul dbe to find a different spot for the gas can. It went inside my rack, but was really awkward to move my drybag around it and was very int he way. AN external mount might be something I will look into. there is a company that makes them, just need to find a place. Which is tough since my sled has a chainsaw mount, chisel mount, and saddlebags. I received these today. They are awesome. Much Thanks to you Dash. This is a pretty popular local spot called Giants Tomb. Lots of sled traffic, parts of the bay are actually staked here so hard to get lost. I do run trail forks app sometimes to track distance though. It's easy to smash a lot of k's when things are as good as they have been lately. Food and Cooking / Re: My New Superfood! Me, I like everything except Liver. That bread looks delish and might even make a killer French Toast. Or pick up a set of knico pipes and/or a straight piece of 5” for your damper. Cabelas in Canada often have them on sale. If you don’t like dark heavy fruitcake this is the stuff for you! Yes, what Mewolf said. If you can find a 5 to 4 inch reducer, that's probably the easiest plan. For some reason I thought I'd click on this and see a fancy bottle of booze of some sort. Is that bread like a Fruit Cake?